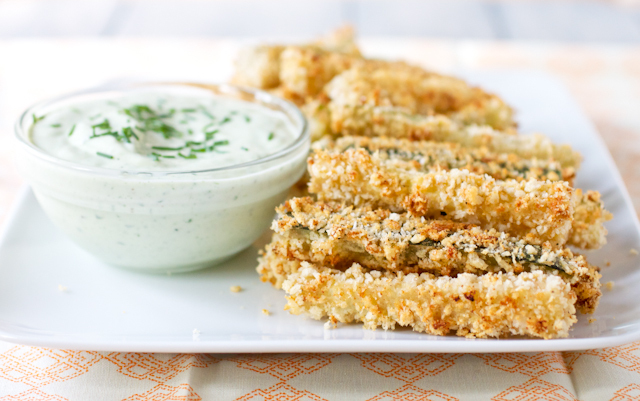 Crispy baked zucchini fries: With a crunchy parmesan crust, these baked zucchini fries are healthy snack alternative to calorie-laden appetizers. As expected, the zucchini yield in our garden wasn’t as spectacular as it probably should have been this summer. I don’t know what it is, but we just don’t have a green thumb when it comes to growing zucchini. The first year we planted it, we got zero zucchini. How depressing! This year, our three seedling plants grew fabulously, flowered like it was there job (it was), and so far we’ve only gotten two zucchini (two more will be ready this week though). From three plants, I don’t consider that to be a success. 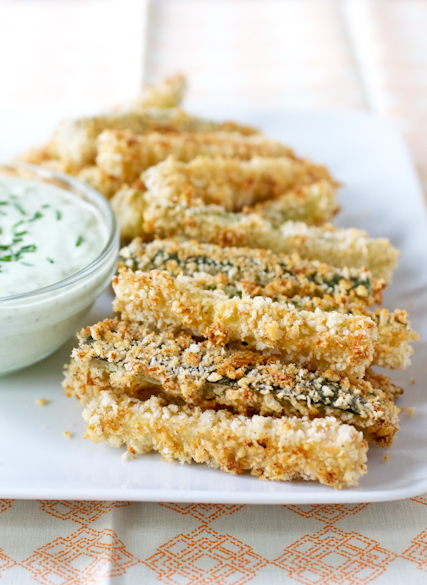 But nonetheless, one of the zucchini we picked got chopped up and made into these baked zucchini fries. And to be able to eat what we grew and picked from our own yard made for such a satisfying dinner, all of the dread of a low yield just melts away. 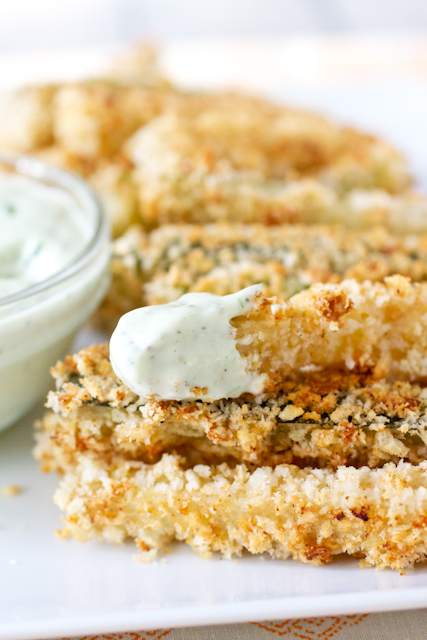 Because these crispy baked zucchini fries are freaking awesome! A quick run through a basic flour-egg-panko combination then into the oven for 20 or so minutes is all that separates you from zucchini heaven. And because the fries aren’t actually fried, I feel like you are actually able to taste the zucchini and not just the grease (there is none of here anyway), which is certainly the goal with such fresh ingredients. They come out of the oven crispy on the outside and tender and not mushy on the inside. And they’re not watery at all, which I was slightly worried about since zucchini is such a watery vegetable. While the zucchini fries were baking, I whipped up a batch of our favorite ranch dressing in the blender to dip them into. This should be a requirement when making these fries! I have a few other recipes planned for the rest of the zucchini that we pick but it’s certainly going to take a heckavalot of restraint not to make these fries again this summer! If you have leftovers, they reheat ok in the microwave, albeit soft and fork-necessary. The best way would be to reheat them in a 375° F oven for 5-7 minutes until they are heated through. Preheat the oven to 425° F. Line a 12×18-inch baking sheet with parchment paper.